Greetings from Wings Cultural Society ! One of the challenging, but imperative aspects of acting includes living the character and becoming one with it. This involves being able to get into another person’s shoes and understanding their perspective. What could be better than meeting this character that the actor tries so hard to adopt? What could be better than to understand the character and their story from the character himself? Wings Cultural Society had an opportunity to enjoy this ecstatic moment by meeting and interacting with Mark Hancock, who was a part of the “The Third Wave” experiment, on which the society’s play “The Wave” is based. Mr. Hancock, here on a tour with a group, was truly elated to discover that Wings Cultural Society understood the relevance of the play and has continued to perform it at various platforms. Eager to meet both the previous and the current cast & crew, he contacted the play’s director, Tarique Hameed, requesting for the same. 11th January 2018, was a once in a lifetime experience for the Society, involving fruitful and enriching discussions with Mark Hancock. It enabled us to comprehend the intensity of the play that we were staging in different parts of the country and the overwhelming emotions attached to it. The meeting involved an informal question-answer session, followed by discussions over a wide variety of issues related to the play. 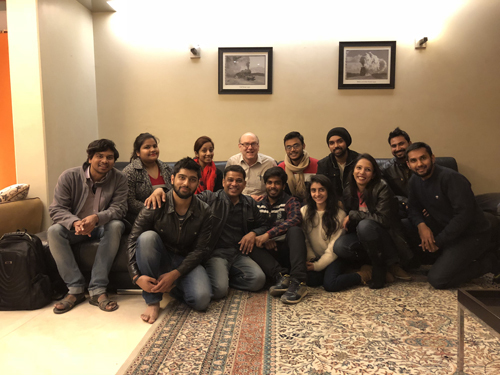 Mark was keen to hear our experiences and struggles as a team in performing “The Wave”, including how and why each one of us related to the play. In turn, he narrated his own personal experiences and provided a background of many of the real-life characters in this play. Not only this, he shared how the experiment changed him as a human being and encouraged him to work for the welfare of the society. He expressed his appreciation for our Society’s endeavour to perform this play and make the masses realize how important it is to question one’s actions and not be simply moved by a leader. Conversing with Mark Hancock and understanding the emotional turmoil of those 8-9 days of experiment, Wings Cultural Society, is more motivated than ever, to take this play further to a larger audience. We are grateful to Mr. Hancock for gracing us with his presence, allowing us to delve deeper in this play, and opening new horizons.